Storrs Congregational Church, United Church of Christ, is located at the corner of Route 195 (a.k.a. Storrs Road) and North Eagleville Road, within the main campus area of the University of Connecticut. Our address is 2 North Eagleville Rd., Storrs Mansfield, CT 06268. Take Route 195 southeast in the direction of Mansfield/Willimantic/UConn. From I-84, you will go a little over 7 miles on Rte. 195, crossing Route 32 and US Route 44. The church grounds will be on your right about 1 1/2 miles after crossing US Route 44, shortly after passing by the ‘Towers’ complex of dormitories and the UConn Horticulture building. Make the right turn onto North Eagleville Road (the traffic light immediately at the corner of the church property). From US Rte. 6, Willimantic, southern Mansfield, etc. Take Route 195 north in the direction of UConn/Storrs/Tolland. From the US 6 / Eastbrook Mall area, you will go just shy of 7 miles on Rte. 195, crossing Route 89 in Mansfield Center and Route 275 as you approach the Storrs Center and UConn campus areas. The church grounds will be on your left about 1 mile after crossing Route 275 / South Eagleville Rd. Make the left turn onto North Eagleville Road (the traffic light immediately at the corner of the church property). From US 44 eastbound, turn right onto Route 195 (Storrs Road). The church grounds will be on your right about 1 1/2 miles after turning onto Route 195, shortly after passing the ‘Towers’ complex of dormitories and the UConn Horticulture building. Make a right turn onto North Eagleville Road (the traffic light immediately at the corner of the church property). From US 44 westbound, turn left onto Route 195 (Storrs Road). The church grounds will be on your right about 1 1/2 miles after turning onto Route 195, shortly after passing the ‘Towers’ complex of dormitories and the UConn Horticulture building. Make the right turn onto North Eagleville Road (the traffic light immediately at the corner of the church property). From Route 32, turn onto North Eagleville Road (about 0.3 miles north of the intersection of Routes 32 and 275 [South Eagleville Rd.]). Continue on North Eagleville Road into the UConn campus area; from Route 32, you will drive on North Eagleville Rd. just shy of 2 1/2 miles. The church grounds will be on the left just before North Eagleville Road ends at Route 195 (Storrs Road). Our parking lot entrance is the first driveway west of Route 195 (Storrs Rd.) on the north side of North Eagleville Rd. The drive runs between our facilities and the UConn Islamic Center building. Additional parking on Saturdays and Sundays may be had along North Eagleville Rd. in the designated areas. Please mind any posted parking signs as well the designated bus stop in front of our grounds. Additional parking on weekends and weekday evenings is also available in nearby UConn parking areas, including behind the Horticulture building and at the south end of the Towers dormitory complex, both accessible off Route 195 (Storrs Road). 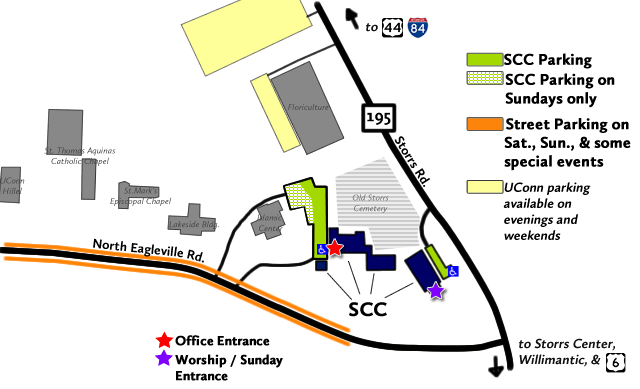 Handicap parking for worship services and other events being held in our Meeting House can be accessed from a drive directly off Route 195 (Storrs Road); the drive entrance is immediately to the north of the Meeting House, next to the Old Storrs Burying Ground cemetery.